F. Scott Fitzgerald may now be regarded as one of the most popular American writers of the 20th century (the sixth film adaptation of his magnum opus, The Great Gatsby, hits theaters May 10th), but that wasn’t the case during the last three years of his life, which he spent in Hollywood struggling to sell scripts and overcome with self-doubt. According to Bruccoli, Fitzgerald made The Ambassador Hotel his home 41 years before Robert F. Kennedy was assassinated at the Mid-Wilshire hotel in 1968. It was demolished in 2005 and has been replaced with the Robert F. Kennedy Community Schools. The rowdy apartment complex where Fitzgerald stayed next is now an ugly strip mall. Across the street used to be Schwab’s little drugstore, where the dried out alcoholic bought ice cream and suffered his first of two heart attacks. Now it’s a massive, less-ugly mall. His favorite bookstore, Pickwick Bookshop, is today a souvenir shop. Fitzgerald had a first date with Sheilah Graham, a mistress, at this Sunset Boulevard gambling and vice spot. It’s now a dry cleaner. According to Graham’s memoir, Beloved Infidel, she and Fitzgerald frequented The Hollywood Bowl and regularly attended UCLA football games. He was a fan of star running back Kenny Washington. This jitterbug nightclub was also the site of one of Graham and Fitzgerald’s early dates. He took his daughter, Scottie, there when she came to visit from the East Coast. Originally on the corner of Sunset Boulevard and Sunset Plaza Drive, it has been plowed over many times. Not far from the original, the Sunset Trocadero Lounge keeps the name alive. According to Bruccoli, Fitzgerald ate his last dinner out at this Hollywood and Vine restaurant with Graham. It too has been plowed over. After dining at Lyman’s, Graham and Fitzgerald went to what was then a movie theater to see the premier of This Thing Called Love. Fitzgerald died of a heart attack the next day. The Pantages is still standing but is now a venue for performing arts. 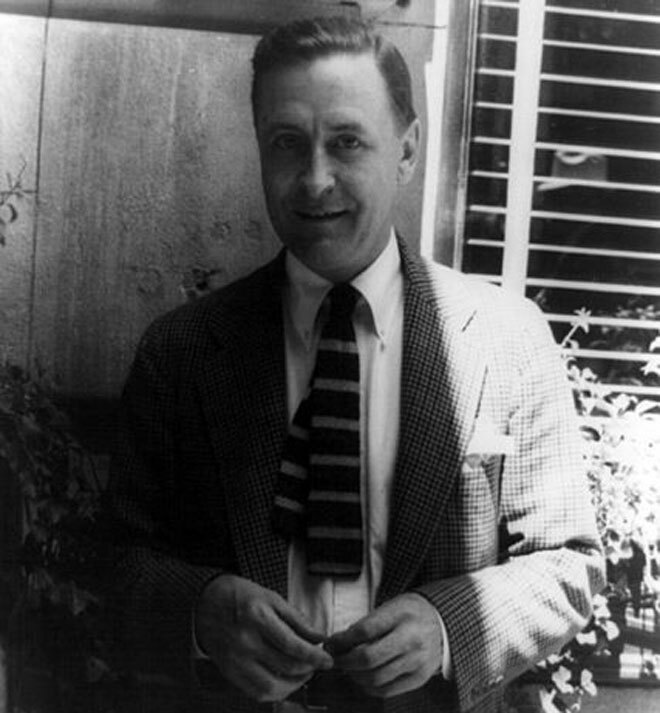 Fitzgerald, and a number of other notable writers, patronized the classic restaurant’s bar. It’s said that Fitzgerald would edit his work while sitting in its red leather booths.